Home / millencollin / reviews / sos / Review || Millencolin - "SOS"
Review || Millencolin - "SOS"
Swedish hall of fame punk rockers, the biggest European punk band of the Epi/Fat era, remain on top of things with the release of their 9th studio album titled "SOS", out on Epitaph Records on February 15th of 2019. I have remained absolutely consistent in following Millencolin’s career and discography from day one with the release of the now infamous and bit controversial "Same Old Tunes" in -I believe- 1994. Their sophomore album, "Life Οn Α Plate" is considered one of the classic skate punk albums of all times well over twenty years later, even if the band itself has moved on from that particular sound. I dare to say that my personal favourite album of theirs was and remains "Home From Home", the record that officially shifted the band’s sound away from the Californian punk sound of the 90’s -as well as that ska influence that everyone blended into their sets- at a much earlier pace than what a lot of their peers were experiencing at the time. From then on, Millencolin have been basically known as more of a rock band, in the moniker that is punk rock and I was totally fine with that. Catchy guitar riffs, the incredible variation in production from album to album and of course the trademark voice of Nikola Sarcevic have carried them to the biggest stages and crowds punk rockers have ever witnessed within that musical landscape. Unsurprisingly enough, Millencolin were the first European punk band that transcended their popularity outside of their home continent, making a great name for themselves in Australia, Japan, the USA, Canada and Latin America at a time when no one outside of Europe really cared about bands coming from there. On a personal level, I consider myself a huge fan, having seen them live abroad in the still early stages of their career -my first trip abroad to see a band play live in 2002 - owning their entire catalogue, including Nikola Sarcevic’s solo records, even the one sung in Swedish with a personal message to me from the man himself. As a foot note, I will skip referring to the unexplainable flaws everyone seems to be noticing at their live show performance. After the release of "Machine 15" in 2008, the band’s most experimental sounding record which I loved as well, Millecolin takes a huge break from recording for almost six years and finally -plus unexpectedly given the time frame in between– releases "True Brew" in 2015, a record that by many is regarded as their best work in the past two decades. I think people tend to forget how good a band can be from a song writing perspective and by adding the huge sounding production to "True Brew". 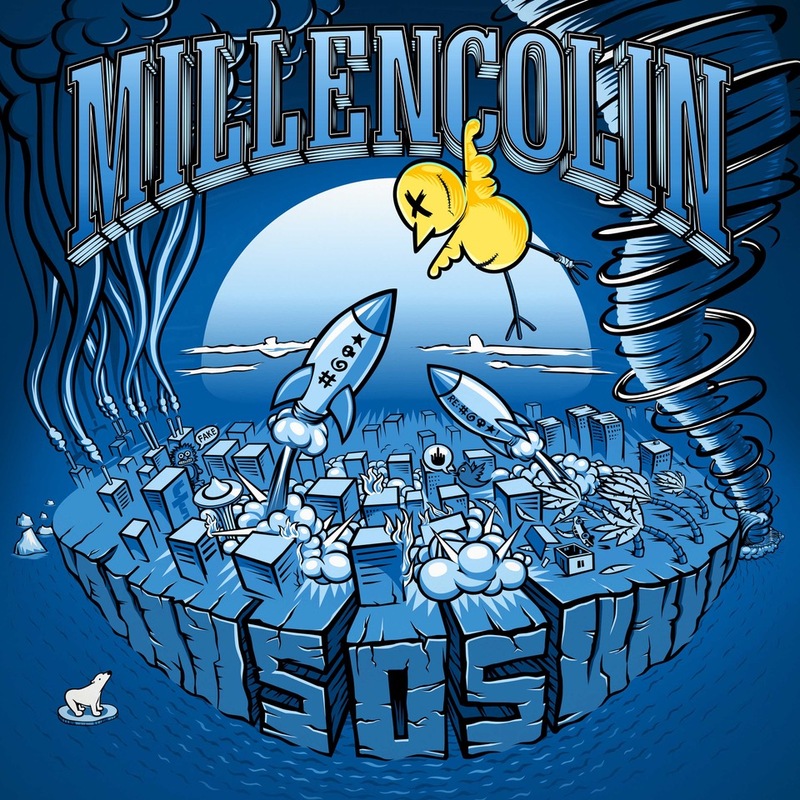 a factor missing from Millencolin’s 3-4 previous releases, the band literally blows everyone off the map, probably gaining new fan base within this process as well. I was pleasantly shocked myself and that record had heavy rotation for years to come. The title song itself still holds a very dear place in my head; simply because it’s incredible. Not even realizing it has been almost four years since the release of "True Brew", I am asked to review the bands new LP, "SOS", for which two songs have already been made public, namely the title track and track number three, "Nothing", both sounding like a natural continuation of the exact previous work. The entire record actually feels like "True Brew" Part 2 (which also rhymes) from every possible standpoint. The band again produced and recorded everything at their own studio Soundlab Studios, again worked with Jens Bogren as an engineer and mixer of the material and of course, as always, handled artwork and style themselves, specifically by the guitarist Erik Ohlsson, and the outcome is as beautiful as ever. 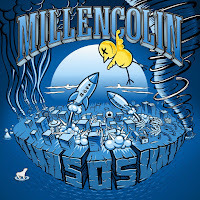 I literally don’t mind the persistence in sound for a second consecutive time, since I believe this sound suits Millencolin completely and it takes almost any of their material to a higher level. On top of that, I think "SOS" is a more conclusive effort in that it flows on a consistent level throughout its twelve tracks and doesn’t feel unbalanced like "True Brew"’s second half sort of felt like (simply because the first half was too good to be true). The guitar riffs are as popular and memorable as ever, even if the band doesn’t really cover new territory and Bad Religion remains the main effect in composing the songs of "SOS", Nikola’s voice is just incredibly resilient and flawlessly delivered, Verses are actually as catchy as some of the choruses, I absolutely love the slightly groovier songs -"For Yesterday", "Sour Days" and "Cavemans Land", the very personal touches behind some of the stories as in "Yanny And Laurel" -one of my favorite songs on the album- and the efficient more political aspect of Sarcevic’s lyrics on "Do You Want War", "SOS" and "Trumpets & Poutine" (as in Trump and Putin). I’m guessing the band figured that "True Brew" worked fantastically and decided to keep things on the same track with the follow up record, perfecting small loose ends. Even this early in 2019, I’m sure "SOS" will be a frontrunner for my punk rock record of the year list at the finish line.